From film "A Small Act"
For an evening of inspiration, it’s hard to beat “A Small Act”, a film that demonstrates the ripple effect that can result from one small act of kindness. The award-winning documentary film directed by Jennifer Arnold, an official selection at the 2010 Sundance Film Festival, tells the story of the unlikely pairing of two philanthropists whose modest acts of charity shine a light on the power of giving — no matter how small the gift. 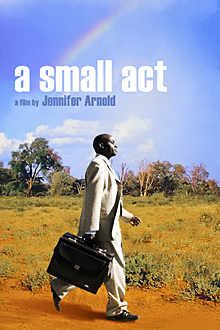 “A Small Act” will be screened at 6:15 p.m. Wednesday (Nov. 17) at the Hassenfeld Conference Center. The film tracks the life of Chris Mburu, who was a child living in a village in Kenya when he first received a $15 scholarship from a Swedish woman named Hilde Back. Her humble but steady sponsorship put Chris through school and eventually launched him into Harvard Law School, paving the way to his job as a United Nations attorney. Now in her 80s, Hilde meets Chris for the first time as he launches his own small act of benevolence -- the Hilde Back Education Fund for the children of his village. Hilde's astonishment at the potency of her long-ago gift is matched in scale by Chrisʼs surprising discovery that Hilde is not Swedish at all, but a German Jew who escaped the Holocaust. In addition to the Sillerman Center, the screening of “A Small Act” is co-sponsored by Facing History and Ourselves, the International Center for Ethics, Justice and Public Life, and the Schuster Institute for Investigative Journalism. Light refreshments will be served at 6:15. The program will begin at 6:30. Inquiries and RSVPs, requested for off-campus guests, may be directed to Coexistence International.